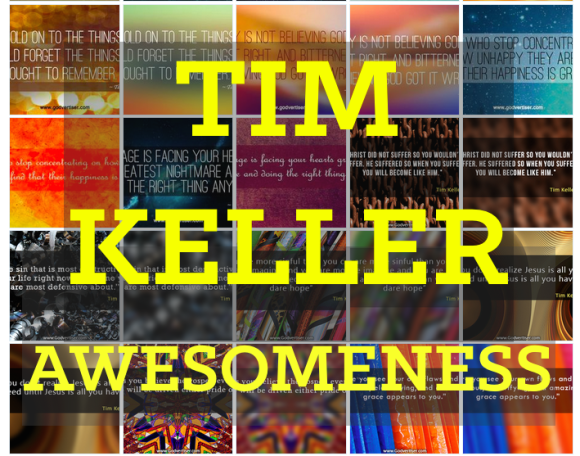 Imagine if your social media feed was filled with Tim Keller awesomeness? Well, here’s your chance. . .
I’m giving away a pack of professionally designed, non-branded, social media network optimized, graphics quote cards. 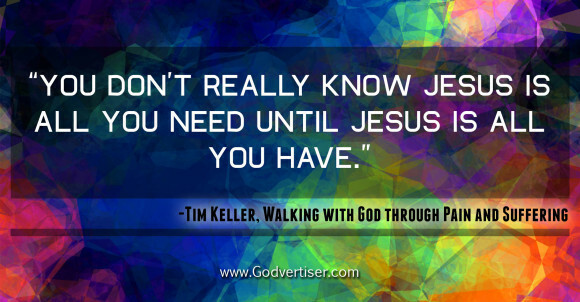 I love Tim Keller wisdom, and want to help you spread some of it across the Twitterverse and more. Just click on the image below for details. I’m excited to share with you that I’ll be speaking once again at the Redeemer Ei Forum conference April 5 & 6 in New York. If you don’t know about the Center for Faith & Work at Redeemer Presbyterian Church, you really should. It is an amazing ministry. Within Redeemer’s CFW is the Entrepreneurship Initiative — which hosts an annual conference on Gospel Entrepreneurship. They also run an annual business plan competition, where ventures run by christian entrepreneurs have a shot at awards up to $25,000 for their non-profit, for-profit or arts start-ups. 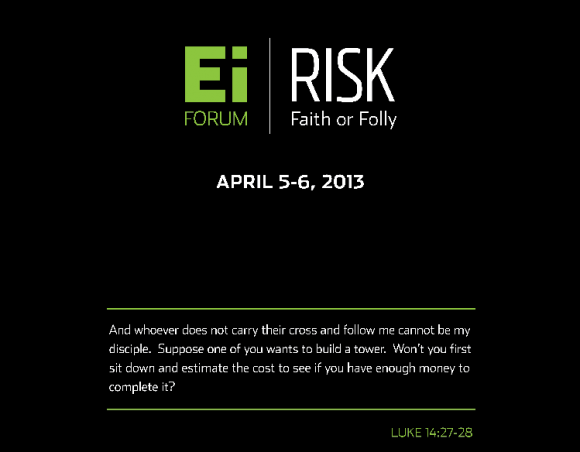 This year’s theme for the Ei Forum conference is RISK: Faith or Folly. 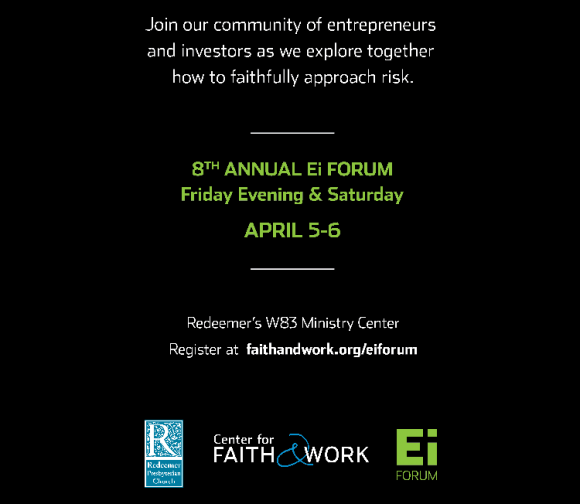 I’m looking forward to hearing Tim Keller’s reflections on how thoughtful christian entrepreneurs can consider risk in a faith and work integration framework. Do you feel the pressure to have a social media presence, but don’t know exactly how it will further your venture’s objectives? Are you a bit fuzzy about when your media campaigns are actually helping or hurting your cause? 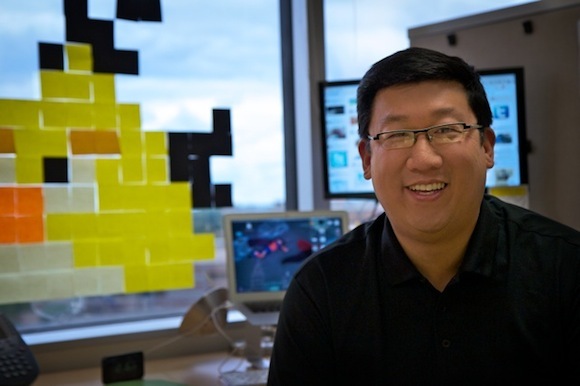 Strategic communications advisor Kenny Jahng will share concrete content marketing tactics at this year’s Ei Forum. Kenny’s insights will help you reap the rewards while avoiding the risks involved with publicity campaigns for your venture. Whether you can make it or not, what questions do you have about social media, PR and how you approach communications with the various audiences related to your organization? 60 days left before you can get your hands on a copy! Timothy Keller’s next book, Center Church is now available for order on Amazon. This is going to be a great week ahead. I’m headed off to Q DC (www.qideas.org) to hear and interact with some forward-thinking ministry leaders and then returning to NYC to participate in Redeemer’s Entrepreneurship Initiative annual conference called the Ei Forum. This year, I’ve been invited back to speak as a communications practitioner and share some of the trade strategies I have been employing for ministry and non-profit campaigns. It should be a great time. Right now, the workshop is shaping up to dive into three specific areas of which many church and non-profit leaders seem to be apprehensive about. These are areas where most know they need to figure out at some point in the near future, but there’s a lot of anxiety, apprehension and just plain fear of being sucked into a time sink that won’t ever end. (1) PR. Public relations is a very powerful tool. Earned media as they call it, can provide awareness, legitimizing influence and tangible outcomes if done well. I’ll share the three keys to success in crafting great PR stories that news media outlets want to cover. (2) Video & SEO (search engine optimization). As our world gets even more media savvy, content production and distribution is becoming easier and easier. Anyone trying to maximize SEO potential, needs to take a serious look at how they can incorporate video into their communications praxis. I hope to share a simple yet powerful framework called the “10-4” methodology for video syndication success. (3) And lastly, social media. Social networks can leverage existing networks and the more important weak links in your contact ecosystem. Last year, at this same conference, I shared my “5 C’s for Digital Community Engagement.” Since then, Google+ has been one of the most recent entrants to the game that everyone needs to take notice about. Not just because Google Plus has gained a tons of users to give it a core network worthy of connecting with, but just the fact that it’s run by the Google behemoth. I’ll have a co-pilot for the presentation from the Google+ team in LA that is flying out to NYC to share some Google wisdom in this area. I plan to share much of the content covered in the presentation here on this blog in the near future. 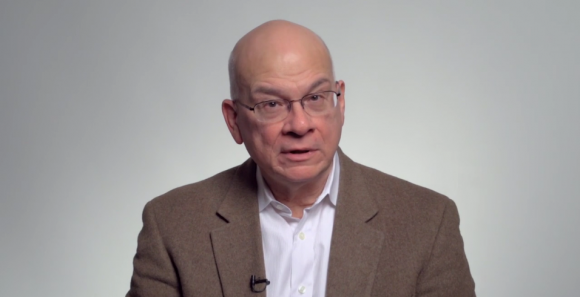 Tim Keller will make an appearance from the stage on Saturday afternoon. 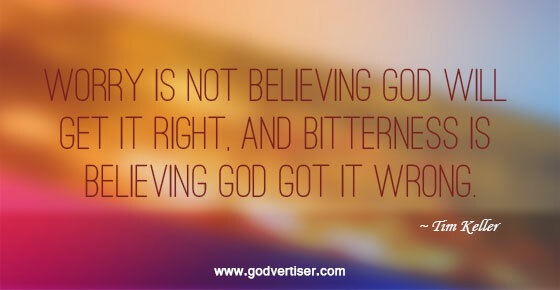 Last year, his Ei Forum talk was about how “God is an entrepreneur.” It was fantastic. I’m looking forward to what Tim has to say this year around. Will you help me with crafting a practical and impactful presentation? What’s your one question that’s top of mind about PR, search engine optimization (especially WRT videos), and social media? Leave your question in the comments section and I’ll see if I can address it directly in the presentation and/or a future post. Well, what happens when they intersect? 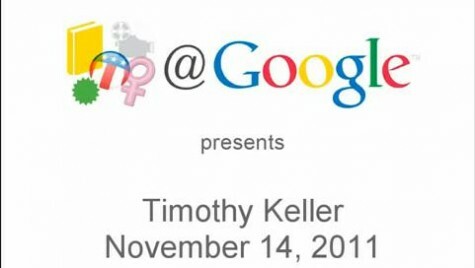 Basically you get Tim Keller speaking at Google HQ in their Authors@Google series. Dr. Keller has spoken there before, and it’s one of the the more popular videos (approaching 200,000 views) on the web featuring Dr. Keller. The latest book out of Redeemer City to City‘s Content Labs is The Meaning of Marriage. 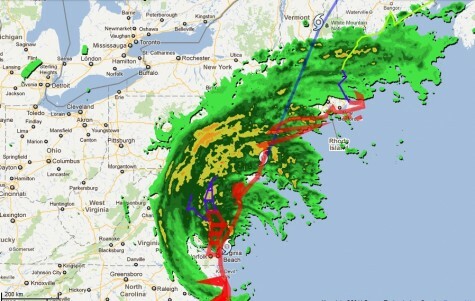 Hurricane Irene stole the stage this weekend as everyone and everything was mobilized on account of the incoming storm of the decade. New York subways, mass transit, airports, etc have all been shut down. Even Redeemer Presbyterian Church cancelled Sunday services on the East Side and West Side. Many, many churches cancelled services this weekend. The only services that were left untouched seemed to be the 160+ Internet Churches including Liquid Church Online and LifeChurch.tv. That’s where I personally plan to go to worship with others in community this weekend. But Tim Keller’s congregation wasn’t left high and dry with this storm in town. Irene might be able to shut a lot of things down, but apparently not so for heralds of the text. . .
Redeemer church published their worship bulletin as well as a free mp3 download of Tim Keller’s sermon, LORD OF THE STORM. 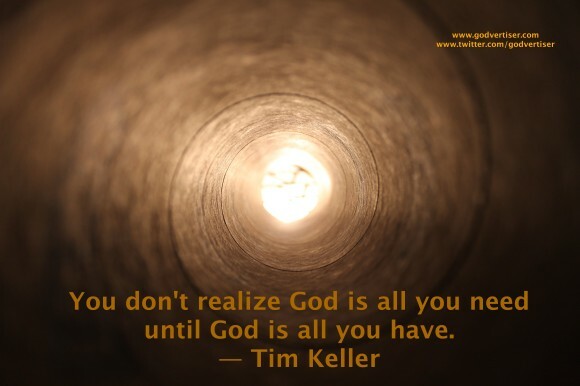 If you are stranded, cooped up inside, or just able to take in a great sermon message, CLICK HERE to download the timely sermon message where Tim Keller preaches from the Book of Luke. Kinetic Typography — that’s the official name of the motion graphics you’ve been seeing pop up all over the net these days. It’s powerful when done right. But there’s a specific flavor of motion graphics that deals with moving typography. Temporal typography to be more specific. And here, we have something called KINETIC TYPOGRAPHY which is produced by a new type of creative producer called a kinetic typographer these days. So get ready for more kinetic typography in the months and years to come. Here’s some examples of great kinetic typography I’ve seen recently. And a big bang at the end. And finally, we’re also seeing some of this format being applied within ministry media applications. I’ve included a fabulous one as the last one in this listing below as a “TRUER & BETTER” final example. . .
Do you know of any other examples of amazing motion graphics – kinetic typography? Share a URL below!